Rural Revolution: Swimming in strawberries!! After years of fantasizing about an all-you-can-eat strawberry bonanza, we have it! A couple of weeks ago, after noticing robins eating the strawberries, we netted the tires. It's worked beautifully, and the June-bearers are bearing in profusion. The ever-bearing are also dumping their load. Suddenly we are swimming in strawberries! We go out about every other day and pick. And still they keep coming. Every single strawberry we don't eat, we're freezing. I love to make various desserts with strawberries, so these fresh strawberries will be ambrosia during the cold winter months when fresh berries are just a memory. Today, for example, Younger Daughter and I went out and picked. We ended up with my two biggest mixing bowls, chock-full. Younger Daughter carried her bowl into the house and put it on the table. It wasn't until after she'd washed her hands that she realized one strawberry stem had threaded through her necklace. We agreed it was a very fashionable look. I hulled all the berries. It was like hulling rubies. After washing and draining, I bagged everything up. And how much did we pick, just today? 11.5 pounds (probably closer to 12, but we were all snacking on them). These went straight into the freezer. I wouldn't be surprised if we ended up with 50+ of frozen strawberries by the time the season is over. Bonanza!! scrumptious!!!! Good for you and yours! I realize with a haul that big, it may not be practical or even possible, but I spread my strawberries (which seem quite meager in comparison) out on cookie sheets and pop them in the freezer for "just a bit" before bagging them. That way, they do not stick together when frozen and can be taken out of the bag, one at at time...which I confess makes it easy to snitch one, or two. I do the same, recommend this so they don't all stick together! I am SOOOOO envious. But after all your hard work setting up the tires and compost - and after your previous "challenges" it was bound to be successful. My hat is off to you all. Congrats on the strawberry haul!! I am hoping this fall, that I can get started on my strawberry patch, and get it planted next spring. I am also dreaming of such a haul. Yummy! I was just curious to know which variety of strawberries you're growing? 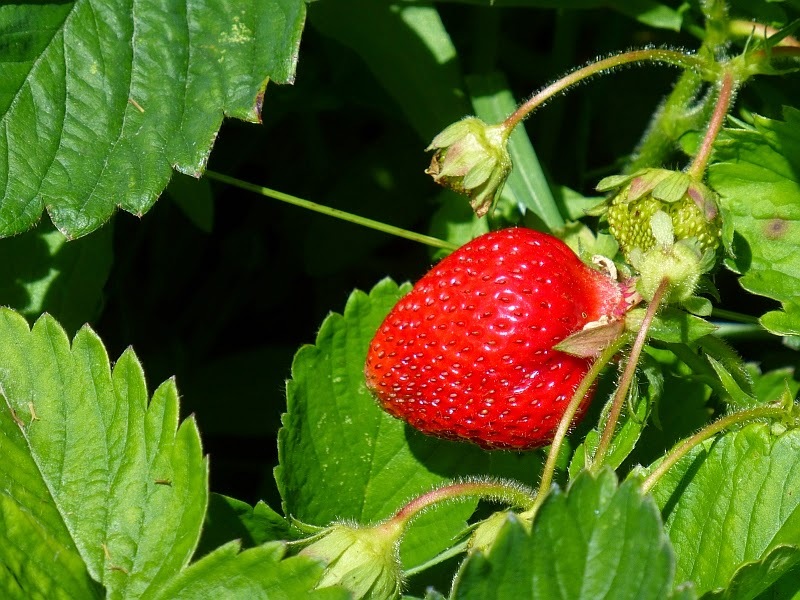 I picked up a few plants last year at the store but have no idea of the variety and they were very small - plus they were ripe in early spring, I like the idea of June bearing berries... Thanks. We wanted something cold-tolerant. They can't be ordered past May or so since they only ship in accordance with when they're likely to grow. Since you are freezing the strawberries immediately after picking them, I am curious why you picked them with the stems intact. When my berries are going directly to the freezer, to save time, I twist the stems off as I remove them from the plant, then once I am in the house, it is just a quick rinse and into the freezer. Now if I am giving strawberries away to someone, then I always pick with the stems attached, since the berries will last longer that way. We tried strawberries the last couple of years and have been disappointed. If we get any that ripen to that size and color, they've got bore holes in them from bug. The ones that don't make it that far were claimed by the bunnies and birds. I read through the posts here: http://www.rural-revolution.com/search/label/strawberries and I see that your nibbled on berries looked a lot like mine! You've been blessed with a beautiful harvest Patrice. All your hard work has paid off - wonderful!! For the past three years I have taught myself how to preserve food after discovering your blog and keenly studying your methods and e-books. I finally bought a pressure cooker and now can beans and huge batches of home-made soup. Have you ever canned strawberries? I have been fortunate in getting access to boxes and boxes of strawberries so I researched canning them. Most info stated that they weren't good to can. I experimented anyhow and have been very pleased with the result. I simply cut up or roughly food-process strawberries and fill a large saucepan full. I slowly warm it to begin with so the berries don't burn. It's then brought to the boil for a few minutes and only a little sugar is added, maybe a cup or so. I guess you don't even have to add any sugar if you prefer sugar-free. I then place this sauce/liquid into bottles and water bath them. The colour remains in tact for many months (the sauce will eventually turn an unappealing brown colour if left too long). Because I haven't thickened it, the liquid tends to separate from the strawberry pieces but I just mix it all in together once opened. It's beautiful over muesli, porridge, yoghurt, ice-cream... the list goes on. I love being able to store them without the need for refrigeration/power. I also dry them by cutting them in an egg slicer (I know, it sounds weird but it works sooo well with even and quick slicing) and placing in my dehydrator. It's amazing the flavor that each thin piece packs. I pray you will enjoy success with the rest of your garden. I thoroughly enjoy following its progress, along with other aspects of your lifestyle. Just curious if you don't mind...How many plants you have? I was just trying to figure how many plants I would need to harvest enough for my family. Thanks! Your strawberry tires look great. Maybe you could do a post on how you irrigate them? Your strawberry tires look great! Maybe you could do a post on how you irrigate them? So impressed with your tire garden this year Patricia! I've been following you a number of years and your gardening posts have always been a bit woeful as critters and weather prevented much harvesting. This year...WOW! Praise the LORD! What abundance! ok I am new to canning and planting things to can and freeze, I lost my strawberry plants last year to moving some things around and they never got uncovered. My children and me all love them and I would love to be able to have some to can and freeze. so my question is how many plants should I plant next year? we are a family of 4 right now. We have ever-bearers in the front yard, and I find the berries get smaller as the season progresses, but much sweeter. Anybody else have the same experience?